It looks like empty space to us, but the open water between the mainland and the islands, and between the islands and the reef, provides habitat to many species. For some it is home, others a highway, nursery, breeding ground or feeding ground. What looks like just empty water to us, offers many different resources and is anything but monotonous blueness! Drag and zoom on the map below to explore openwater habitat. Tidal currents force water around reefs and islands, making eddies and swirls that can temporarily hold nutrients and plankton in one place. Salty water is denser than freshwater, so fresh, nutrient laden water from heavy rain will stay in a layer at the surface until the wind mixes it up. 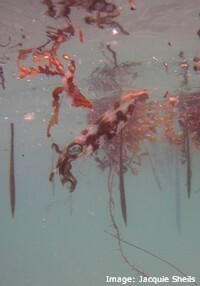 Some of the bits of slimy stuff that spoil your underwater photos when underwater visibility is bad are 'marine snow'. Marine snow is made of bacteria, slime, poo and the remains of tiny living things. Marine snow that doesn't get recycled by being eaten by something, will sink to the bottom, taking its nutrients with it. Colder water is denser and tends to sink below warmer water, so once nutrients sink into this cooler, darker bottom layer, they tend to stay there, unused and out of reach of the plants at the sunlit surface. At the surface, wind pressure creates convergence zones, places where water and wind movement concentrate floating objects and plankton in long bands. These are the 'windrows' of flotsam and drifting algae that can stretch for hundreds of metres along the surface. These are places where life gathers; the possibility of food, and a place to hide among floating objects, attracts everything from plankton and juvenile fish to jellyfish. This makes convergence zones a hunting ground for mobile predators like pelagic fish and seabirds. All of these effects make the 'open water' a patchy, constantly shifting habitat for the plants and animals that spend all, or part, of their lives there. 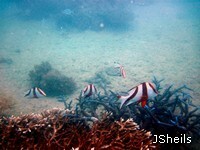 Tropical waters are very clear because they are mostly low in nutrients. 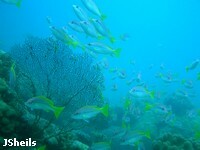 Anytime nutrients arrive in the brightly-lit surface waters, they are quickly used up by fast growing plankton. 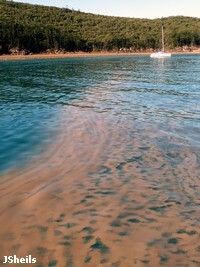 Pulses of nutrients come from heavy falls of rain, cyclones, blooms of Trichodesmium sp. algae and periods of strong, south easterly winds. Long spells of strong south easterly winds push lots of water across the continental shelf. It gets replaced by water that wells up from the depths, off the edge of the outer shelf break. This upwelling brings up colder, denser, nutrient rich water, that stays below the surface and and moves in patches right across the continental shelf. These 'blobs' of nutrient rich water feed the fast growth of 'plant-like' plankton, or phytoplankton, which then feeds the growth of 'animal' plankton, or zooplankton. Plankton is the name for the whole mass of life that drifts in the surface waters of the sea. The name comes from the Greek 'planktos', which means 'drifting'. It is made up of a bizarre mixture of single and multi-celled plants and animals, as well as a lot of things that don't neatly fit into either category. 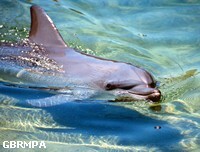 There are permanent residents and temporary blow-ins, and the juveniles of animals that eventually grow up and leave to live in other habitats. These 'plant-like' plankton, or phytoplankton, are the primary producers of the sea, turning sunlight into sugars by photosynthesis, so that they can make more of themselves. They are so good at it that these tiny, microscopic plants provide about 70% of the primary production on the Great Barrier Reef. 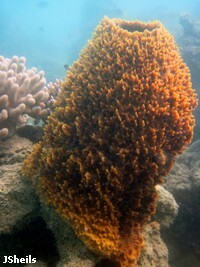 This group includes the zooxanthellae that can also live inside corals and other animals. 'Protist' is a name given to many different, unrelated groups of creatures that are somewhere in the no-mans land between the categories of 'animal' and 'plant'. This includes marine algae, so there are lots of protists in the plankton. One that grabs attention is Noctiluca scintillans, a dinoflagellate that feeds on phytoplankton and produces the beautiful phosporesence that lights up the surface of the sea on dark nights. Mostly you can only tell that phytoplankton are there because the water looks green, but one type of phytoplankton really makes its presence smelt. Trichodesmium erythraeum is a filamentous blue-green algae, although it's actually reddish in colour. 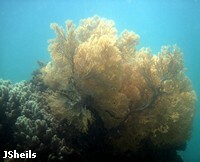 Blooms of this algae are thought to have given the Red Sea it's name. It blooms in calm, sunny, warm conditions and the rapidly multiplying cells stick together in clumps that you can see floating just under the surface of the water. This earned it the name 'sea sawdust'. When the Trichodesmium cells have used up all of the available trace elements in their patch of surface water, the party is over and they die and decompose. This makes them float to the surface in big, smelly and very colourful slicks, which can be mistaken for oil slicks and other kinds of pollution, or even coral spawn. These slicks are food and habitat for zooplankton. It may seem to be a smelly rotten nuisance, but Trichodesmium does an important job. It 'fixes' nitrogen from the air into a form that marine plants can use to grow. Slicks of dead Trichodesmium are spread around by waves and currents, fertilising patches of new plankton growth in surface waters where it is usually all used up. Trichodesmium may be providing up to half of the useable nitrogen in the world's oceans! 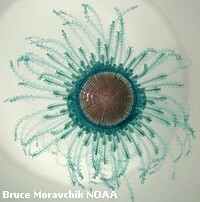 The 'animal' plankton, or zooplankton, can be anything from minute crustaceans, to worms and big fat jellyfish. 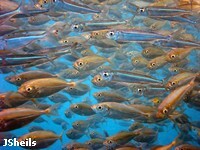 They include tiny grazers that eat the phytoplankton and predators that eat other zooplankton. In the zooplankton you find diverse 'herds' of millimetre long, shrimp-like copepods, minute predatory monsters like the sabre-toothed arrow worms, and seasonally, masses of larvae of fish, crustaceans, molluscs, corals and more. Zooplankton can increase their numbers wildly whenever food, in the form of phytoplankton, blooms. Although they don't swim long distances, plankton do migrate up and down in the water column. For phytoplankton the daily commute means moving up to the brightly lit surface at dawn, then down into the depths at night. Many zooplankton do the opposite, leaving the surface to hide in the depths all day and moving up again at night to feed. 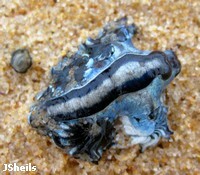 Smaller predators include the 'jellyfish', a name that encompasses several different groups of animals, and even a planktonic mollusc, Glaucus marginata, a nudibranch that not only eats bluebottles, but manages to keep their stinging cells to protect its own body. 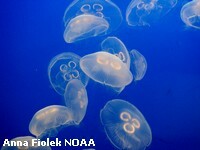 Amongst the jellyfish are the harmless moon jellies, blubber jellies and comb jellies. The first two are truly jellyfish, but comb jellies belong to an unrelated group called the ctenophores, which catch prey using sticky mucus, not stinging tentacles. Siphonophores are not jellyfish, nor even a single animal, but rather a colony of relatives of the jellyfish, the hydroids, with each individual specialised to do a different job. 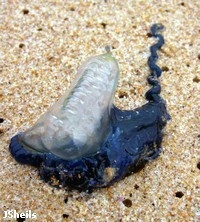 Some are surface specialists, like the bluebottles, the beautiful Porpita porpita and the by-the-wind-sailor Velella velella. 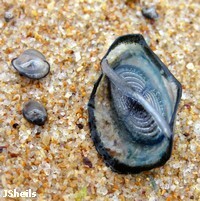 The sails of Velella velella allow them to travel by the wind. Plankton provide food for some of the largest creatures in the sea, including manta and devil rays, whale sharks and baleen whales. They also feed juvenile fish, bottom dwellers like corals, and multitudes of small 'bait' fish, that provide the link between the plankton and the larger predators like seabirds and pelagic fish. 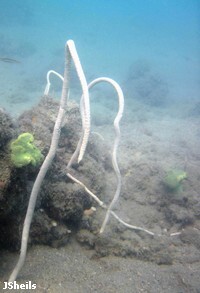 Down below the surface, there are vast plains of sand and mud, dotted with 'islands' of life, in the form of inter-reef gardens of sea fans, sea whips and sponges. These filter feeding animals provide the rest-stops on the blue highway, for the many species that move across the continental shelf from the mainland to the outer reef. Many fish species make this journey during their lives, including the Red Emperor, Lutjanus sebae. Crustaceans like mud crabs (Scylla serrata) and tropical crayfish (Panulirus spp.) also make the risky journey across the shelf to breed. These patches of habitat provide animals with the food and shelter that they need to survive the journey. 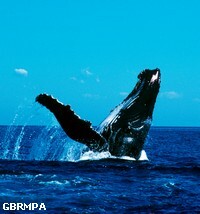 Openwater habitat is used by whales and dolphins throughout the year, and becomes very busy with migrating Humpback Whales (Megaptera novaeangliae) during the winter. Green sea turtles, (Chelonia mydas), Hawksbill sea turtles (Eretomochelys imbricata) and flatback sea turtles (Natator depressus) move across open water as they go through different stages of their life cycles, and as they migrate between their feeding and breeding areas. Dugong (Dugong dugon) also cross open water as they move between feeding areas. Seabirds fly over open water, feeding on creatures that live at the water's surface.